Mike Reed (photo by Justin Jones / ESB) improved his undefeated record to 9-0 (6 KOs) when he took on game opponent Regino Canales in the main event at Rosecroft Raceway Friday Night Fights. The contest was halted by the referee at the end of the fourth when ringside physicians decided it was unsafe for Canales to answer the bell for the fifth round. Shortly after the bout was stopped Regino collapsed in the ring and seemed to have seizure like symptoms. He was taken out the ring on a stretcher and evaluated at Prince Georges County Hospital. I am glad to report that he was treated and released this morning. Mike stayed behind his high guard and worked his way in with the jab. He was throwing bombs from both hands that connected to the head and body of Canales. Mike dropped Canales in the third round from a combination of punches ending with a right hook. Mike’s defense was on display as well as he made Canales fall to the canvas from missing a wild right hand. From round one Mike worked the body and by the fourth round you could see that they were effective. Caneles began to bend forward from the body shots and wince, showing that he was bothered by the hooks to his midsection. Caneles went to the ropes in the final seconds of the fourth round and mike went on the attack. Canales finished the round on his feet but the ringside officials had seen enough. Canales record has now dropped to 6-5 (2 KOs). Mike put on a crowd pleasing performance at Rosecroft which is located in Fort Washington, MD. 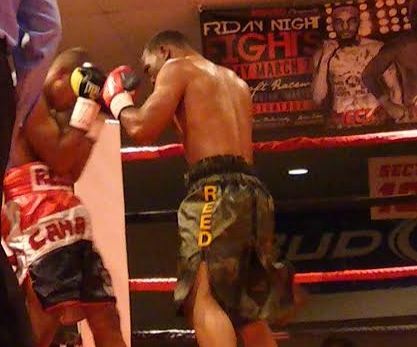 We will continue to lookout for Mike Reed as he campaigns in the junior welterweight division. Next boxing news: Hopkins-Shumenov: Fighter, Media, and Fan Predictions!